So this weekend as I went shopping, I thought of going to Moments Mall, Kirti Nagar (after a long time). Generally when I walk into the mall, I see Fast Trax outlet standing in a space designed protruding outside the mall’s rectangular design. I remember coming for the store launch in mid-2012, which also saw some of the team members of Kings XI Punjab. But to my surprise when I walked into the mall on Saturday, I saw the store was closed and the space was covered with mall’s flex ensuring that there will be an eating joint coming up soon. Even Just Dial tells that the outlet is shut. I took a sigh and moved in the mall (they always keep changing the entry checking counter, its left once and right the other time I go). This time when I entered from the right hand side (where you enter and see the Kapsons’ anchor store). Sadly, this time even Kapsons was gone and I just said to my mom “OMG. Kapsons has shut the store. It was their only store in Delhi.” This space was also covered with mall flex. 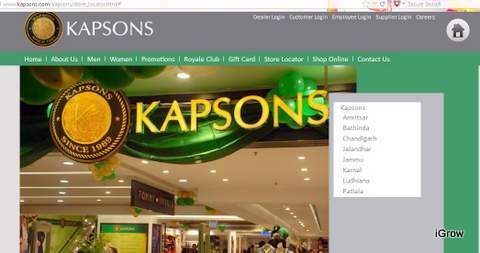 Kapsons website doesn’t have Delhi in its list of store locations. I always saw Moments Mall as one of the malls in Delhi which has been underrated but has some interesting mix of brands and also some of the exclusives including Sanrio and Ave.neu. In fact, the mall was the first to open Marks & Spencer‘s new format outlet (it’s a well designed store, fell in love with their trial rooms) and adorns one of the largest more. store in Delhi. Still trying to decipher why, I think the mall has to work strongly on creating a stronger and welcoming environment for consumers as the crowd is not too large, unlike other malls around the area. I think a lot many retail destinations in nearly 3-4 kms of diameter of the mall (which is comparatively a newcomer), including 4 malls in Rajouri Garden, retail market in Moti Nagar & Rajouri Garden, makes it difficult for it to give the consumers a reason to come and shop. In fact, no multiplex is another reason why there is less number of walk-ins.